UndeleteMyFiles Pro (Windows) - Easily recover lost files! ~ Android Forever! UndeleteMyFiles Pro (Windows) - Easily recover lost files! 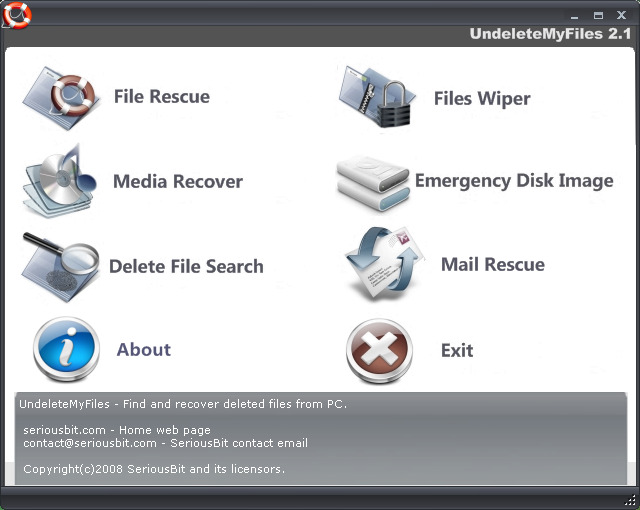 Developer Quote: "UndeleteMyFiles Pro is a free profesional tool to recover accidentally deleted files from hard disks, USB flash drives, CF and SD cards and other storage media." Bet you were thinking I'd given up on posting Windows applications. Fooled ya! Here's an excellent recovery utility for when (not if!) you accidentally on purpose delete something you really really need. File Rescue - The File Rescue Wizard is a quick and easy way to find and recover deleted files from PC. It employs a simplified two-step process that enables you recover any files that used to reside on your system. Media Recover - Recover media files in a couple of easy steps. Deleted File Search - Provides a great variety of specialized filters that allow you to find and work closely with specific deleted information and files. Files Wiper - The Security Tools allow you to delete any files permanently without recovery. Mail Rescue - Mail Recovery Wizard. Free - Absolutely free, no joke.